我从未想过我会推荐波哥大, 哥伦比亚作为旅游目的地. 对我来说一直是资本和寒冷的地方去. 我很高兴地说，这最后一趟后资本, 我认为波哥大DF会为一个伟大的起点的人去了解哥伦比亚. 波哥大不具有的海滩 卡塔赫纳, 它不具有 麦德林 春季天气, 但就是缺乏有, 它在文化弥补, 用餐, and much more. 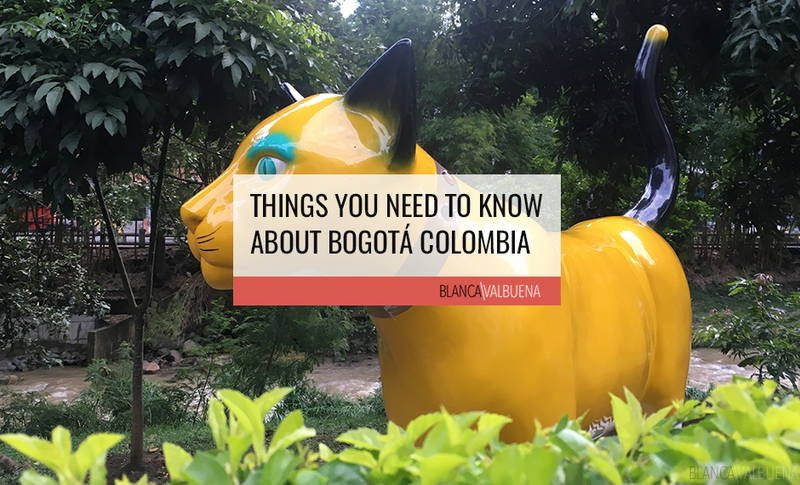 今天, 我会告诉你为什么你会爱上这个城市, and I’ll tell you all the things you need to know about Bogotá so you can have a fun (safe) and memorable trip. 在波哥大天气可能有点善变. 这个城市是比大多数的国家更冷，因为它是在安第斯山脉依偎, 但是从美国的人, 天气天上. 城市可以从阳光明媚的去秒阴雨. 我们在这里在一月份，天气是相当温和. 它已经45F之间摇摆不定，以70F. 基本上, you can wear a dress with boots & stockings and then put on a light jacket at night. TAXIS/UBER: 我真的不喜欢在哥伦比亚出租车. 他们试图镍和角钱您带你更长的方式，当你与他们不同意将与你争论. 这些汽车是老年人和还挺甜的. 如果你这样做乘坐出租车, 没有一个冰雹在街上. 要求餐馆或酒店，你是住叫一个给你. 我是一个尤伯杯风扇. 尤伯杯可能会稍贵, 但它是如此值得的. 然而, 尤伯杯是哥伦比亚非法. 当你得到一个尤伯杯, 你要确保一个前座获取和你打招呼你的驱动程序，如果你知道他/她这样他们就不会与警察惹上麻烦. 如果您收到在机场捡到, 该驱动程序会满足你在二楼，那里有少坐出租车. BUSES: 公共汽车是超级便宜而且由于在大多数情况下，他们指定车道, 他们比出租车快还是尤伯杯会. 然而, 他们可以得到相当拥挤. 如果您在下班时间乘坐大巴, 你应该是一个-OK. 只是介意您的贵重物品. 波哥大是更安全比过去, 但是这仍然是一个很好的预防措施，以取. Colombian People are quite Friendly ( some would say they overstep peoples personal space) but also very relaxed with schedules (even with hours appart). 我相信哥伦比亚人民可以延长一个天大的热烈欢迎你. MEN: 不要穿短裤和拖鞋, 缸, 或父亲. 不要穿俗气T恤. 不要穿一双漂亮的休闲裤和白天马球和一个按钮在夜晚. Did I mention NEVER wear shorts? LADIES: Do not wear those ugly Victoria’s Secret sweatpants. 白天, 穿牛仔裤与一个漂亮的一双靴子和一个漂亮的毛衣. 晚上, wear nice dresses (just keep weather in mind). 在波哥大, 你着装得体. 如果你觉得你来波哥大很容易被放置或找一些年轻的妓女, 去别处. 色情旅游的不冷静和波哥大不是那地方. 任何地方应该是. 大多数Bogotanas的要求尊重和不容易. 哥伦比亚人出生在他们的血液舞蹈, 所以只是因为你跳和一个女人在一个俱乐部, 但这并不意味着她与你回家. 玩的开心, 调情, 但明白这是不是在波哥大的文化. 请不要误解友好作为性爱的邀请. MUSEO DEL ORO: 如果你一直在阅读这个博客在所有, you know I’m a sucker for museums…but this is a museum even a museum hater would love. 有金子做的，将打击你的头脑吨前哥伦布件. 蒙塞拉特: 如果你想要的城市的最壮观的景色之一, 这是你想要去的. It’s located 10400 英尺海拔. 要到那里，你可以乘坐缆车或teleférico . 除了视图等景点是一个美丽的教堂, 工艺品商店, 食品. USAQUEN: It has been a part of Bogotá since the 1950’s and is one of my favorite neighborhoods in the area. 有有周日很大的跳蚤市场一个超级可爱的殖民区. 一些城市的的 最好的餐馆都在Usaquén, 所以如果你喜欢吃, 一定要安排几个午餐或晚餐有. NEMOCON: 这是该地区的另一个盐矿. 它的体积更小，比锡帕基拉少花哨, 但风景华丽. 还有一个很酷的化石博物馆, so if you have kids (or grown up kids like me) it’s a pretty cool experience. LEYVA: 这是一个伟大的小城镇有不错的餐馆, 网吧, 音乐和艺术画廊. 它更像是一个氛围像村. No des Papaya: 你会听到这句话遍布哥伦比亚. 它主要是指不引诱劫匪. I hate this phrase because it’s the equivalent of telling a woman that she deserves to get groped if she wears a revealing outfit (this makes me so angry), 但可悲的是, 这仍然是可靠的建议遍布哥伦比亚. 这意味着，如果你有一部智能手机, 你不应该使用它在街上. 不要穿花哨的首饰和围绕它闪烁. 这是更好地将简约波哥大，如果你想保持安全. 如果有什么事情确实发生, 只是给盗贼他们想要什么. Pay attention: 尤其是过马路时，. Drivers (I’m looking at you taxis) drive like maniacs in Bogotá. 所以穿越街道时要非常小心.